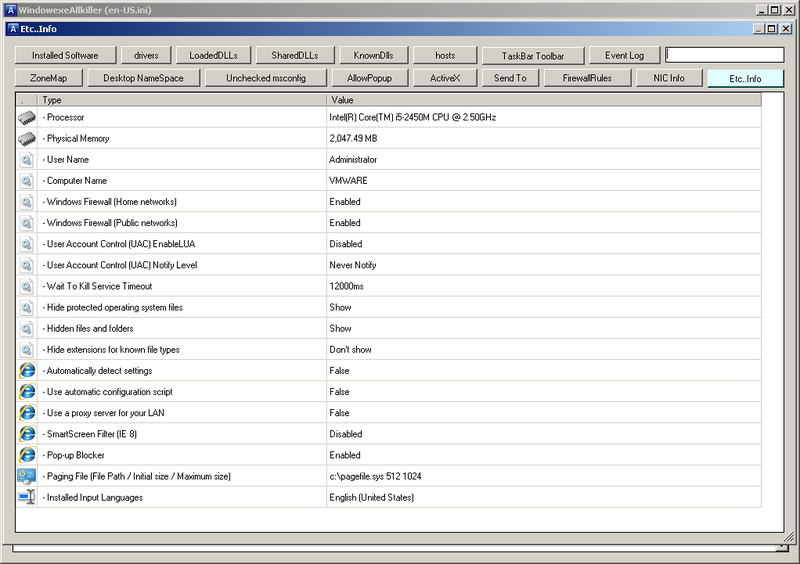 WindowexeAllkiller is a free utility created as a general service to the public. In what is now a common practice, including many reputable and leading companies, software applications (junk) have been inserted into commercial software. This software interferes with the operation of laptops and desktops. The speed and flexibility of the computer is compromised by this software junk which is often difficult to remove. To make matters worse, companies that offer to help you remove this junk, in many cases, do so because they want to install their own junk. Windows operating systems are open to infection by a great deal of malware that can slow down your computer and make it difficult to use. It is not always easy to remove this malware. WindowexeAllkiller is a way to remove unwanted malware from your computer. It is not highly automated. It requires the user to be able to identify what it is that he or she wants to remove from the computer, and the assumption is that the user has done adequate research and carefully considered what to remove. If you have found this web site because you are searching on the specific file name of a browser help object or commercial pop ups that are making it difficult to use your computer, this is a good utility to try. A word of caution: WindowexeAllkiller is a utility that returns control of your machine to you. You must *actively approve* --by placing a check mark--the utilities that *stay* on your computer. The program check marks a few automatically. Many of the things that you might choose to remove are from legitimate companies that provide a valuable service. For example, you can remove the Adobe update reminder that pops up very frequently on most PCs. But remember that Adobe is a necessary web tool for reading pdf file formats and that often times the automatic Adobe updates are used to fix security issues. New users of WindowexeAllkiller should concentrate on one or two the most serious malware problems on the PC they’re fixing in order to learn the program. Once you are familiar with the program, you may find it is a convenient tool to remove a large number of unwanted programs at once. To be an effective user of WindowexeAllkiller you need to have a clear idea of what you wish to remove from your computer; once you have gotten rid of active malware, you might use WindowexeAllkiller to customize your computer's operations by setting aside certain operations to do manually, such as updates. If you are completely new to computers this utility is not for you. If you have reached the point of doing extensive research on how to remove a difficult object, and such obvious steps as UNINSTALL in the windows control box have not worked for you, this may help you out. More experienced users may realize that WindowexeAllkiller is a way to neutralize programs more quickly than the UNINSTALL utility allows, because you can neutralize many programs at once. WindowexeAllkiller is therefore a time saving device for advanced users who want to customize the operations of their computer. Before you use WindowexeAllkiller make sure you CREATE A RESTORE POINT in your version of windows. This will allow you to start over if there are problems. You will find many instructions on how to do create a restore point on the Internet. When you have later removed objects successfully you might wish to CREATE ANOTHER RESTORE POINT so that you have a clean version of your computer to return to in the future. I can't speak english well. I hope you don't mind even if some sentences do not make sense. Refer to the below user's detailed guide and introduction video. It will help you to understand better. * We are looking for More experienced users of WindowexeAllkiller who will translate this manual into different languages. Please send us the translation via email. * Your website url or blog url will be displayed on top-right page. WindowexeAllkiller is easy to use, very simple and very powerful. However, A beginner has to use WindowexeAllkiller extremely carefully. This utility can remove Startup, Browser Helper Object, Toolbar, Services, Task scheduler, Chrome Extension and Unwanted software(malware, trojan, malicious svchost.exe, ad-popup, and so on..) at once. LEAVE IT UNCHECKED that You wish to delete, Click the button on the top. LEAVE IT UNCHECKED items will be all deleted. Do not confuse this the other way around. It can freeze your computer. Running processes. the system process does not appear on the list. * If LEAVE IT CHECKED, the process will not be terminated. * If LEAVE IT UNCHECKED, the items will be deleted. Internet Explorer Browser Helper Object(BHO) module. - First column foreground color : Black - windows default service. Red - third-party services. - Second column background color : LightBlue - It's not windows default .dll files. Startup of Local Group Policy Editor. 3rd-party web browser extensions(firefox, opera, torch, citrio, comodo dragon), this section is read only. do nothing. * If LEAVE IT UNCHECKED, the items will be disabled the Extension for Chrome. Shell Open Command Context Menu. * If LEAVE IT UNCHECKED, Delete the %WINDIR%\system32\drivers\etc\hosts file and create default hosts file. * If LEAVE IT CHECKED, Change your Internet explorer homepage, open a WindowexeAllkiller.txt file and edit. * If LEAVE IT CHECKED, does not remove Secondary Start Pages. * If LEAVE IT CHECKED, Clear the Address Bar Dropdown list. (Windows Explorer and Internet Explorer). * If LEAVE IT CHECKED, Empty Recycle bin. * If LEAVE IT CHECKED, Clear My Document History. - If svchost.exe process is running from C:\Windows\temp directory, this process will be move to Backup directory. - If svchost.exe process is running from C:\Program Files\anydir\anyname directory, this process will be move to Backup directory. - If csrss.exe process is running from C:\Program Files\anydir directory, this process will be move to Backup directory. * If LEAVE IT CHECKED, does not remove fake svchost.exe , csrss.exe , dllhost.exe , spoolsv.exe , smss.exe. Run a User-defined program, the user-defined program will be run one second interval, open a WindowexeAllkiller.txt file and edit. * If LEAVE IT CHECKED, Run a user-defined program. * If LEAVE IT CHECKED, Run WindowexeAllkiller at Windows Startup. Please LEAVE IT CHECKED, if the programs are trustworthy. UNCHECKED items(01, 02, 03, 04, 05, 06, 07, 08, 14, 17, 18, ~ to 37) will be all deleted. Disabled BHOs' and Disabled Toolbars' Background color is LightGray. The items listed on second column with the Bright-Blue color background in [05-SERVICE]** are ServiceName list which are .dll file used by svchost.exe process is not provided by Microsoft. Use Google to search the .dll file names on your list for sure. Some of them could be malignant. If SstpSvc Service's dll file name is not sstpsvc.dll, then second column fill the bright blue. [05-SERVICE]**SstpSvc - C:\Windows\system32\svchost.exe -/- C:\Windows\system32\sstpsvc.dll - Second column background color is White. [05-SERVICE]**SstpSvc - C:\Windows\system32\svchost.exe -/- C:\Windows\system32\malwaresvc.dll - Second column background color is Bright blue. 3rd-party web browser extensions. read olny. If Installed plug-in directory is not exists, Foreground color is SlateGray. You can remove shell context menu easily. File, Directory, Recycle Bin, Desktop, All File System Objects. Auto Scroll, Change Cell Background Color. Finally, Make sure all items are CHECKED/UNCHECKED STATE correctly, Click the button on the top to save the current setting and delete the UNCHECKED items. If you want to see the management window again, delete the WindowexeAllkiller.txt file and run this program. Deleted startup program and service items will be backed up in the Backup folder. BHO, Toolbar, TaskScheduler and Some Sections are not backed up. Do right-click on the list, you can browse selected item, copy list to clipboard, disable selected item service, extension tools. Select One and Right Click, You can remove selected item. When you get a new computer you are at the mercy of both the manufacturer and microsoft. A lot of adware is loaded into the initial vesions. For the most part you can uninstall these, but some are very pernicious and hard to find. WindowexeAllkiller can help you. 02. Move zipped file to any directory you like; "programs" is one possibility. 03. Unzip the folder. When you unzip the folder, a second, unzipped folder should appear in the same directory. 04. In the unzipped folder, right click on WindowexeAllkiller and make sure you choose "run as administrator." 05. You will see a bewildering array of file names. Remember that most of these are USEFUL and that you want to LEAVE THEM CHECKED. 06. It is likely the case that if you are using the WindowexeAllkiller utility you have tried very conventional removal tools like uninstall and they haven't worked. You may have tried going to your C directory and using "search" tried to identify the malware that you can't get rid of. Although many malware files can be deleted manually, a few, such as toolbarupdater, have a defensive trick. When you highlight them they activate and show up in your taskmanager as active programs. That means they are protected from conventional deletion. So, at any rate, you can use your C directory search to find the various names used by the malware (toolbarupdater is from AVG). The general point is that you have to be familiar enough with the enemy malware to identify it in this list, so you have to do a bit of homework on your own machine and also possibly on the Internet/google. As we have said, by the time you decide to use the WindowexeAllkiller utility, you have likely exhausted conventional uninstall alternatives such as the Windows Uninstall utility in the control panel. Even CCleaner does not get some of the junk that WindowexeAllkiller will find. 07. So, you've opened the file in "run as administrator" and you know what filenames are associated with your malware. In the open WindowexeAllkiller, you will see highlighted items. Many are friendly, but your foe is likely lurking here. You have to go through them one by one. To be conservative, check anything that you don't understand or have not identified: many of these highlighted items are useful, such as motherboard software and windows utilities. To understand what you are seeing, run the file names on a google search and see what you learn. You can delete many items (BY LEAVING THEM UNCHECKED) that you identify as useless in this way if you prefer. Nonetheless, the *safest* thing to do is target directly the specific malware you know is causing a problem, and leave everything else checked. 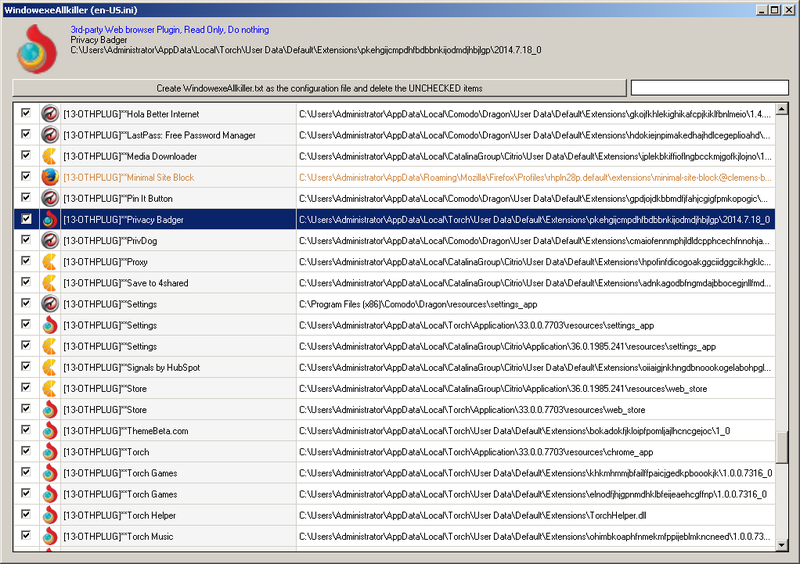 So, for example, with AVG the known issue is toolbarupdater and anything with AVG in the file name. So the conservative choice is to LEAVE UNCHECKED *ONLY* THOSE ITEMS with AVG or toolbarupdater in the file name. That said, there is a lot of garbageware that comes with factory installed computers, which you cannot fail to miss because they will be annoying you with pop ups. So you may wish to remove more than one at once. 08. There are a whole bunch of files that have been checked by default (to preserve them). You might delete some of these some day but don't do it your first time around. 09. There are a bunch of files at the bottom of the WindowexeAllkiller display that are not highlighted, and not checked. Verify that your enemy file is not there, and just leave them alone. 10. You most likely have spotted your malware in the long list of files identified by WindowexeAllkiller. Make sure the malware is UNCHECKED. That everything else is checked, except the files at the bottom. Use the philosophy, "Innocent until proven guilty." 11. So now you're ready to kill the malware. There's a long bar at the top of WindowexeAllkiller's display of files. Click it, verify you want to run it in the popup that asks you if you really want to do this. 12. That's it, there are no bells and whistles to tell you that you're done. A brief note appears in the notepad file in your directory. If you want a good detailed view of what's going on do a "before" screen shot of your Task Bar programs--that is, before you run WindowexeAllkiller the first time--and compare with the output in notepad. 13. Now it's time to reboot. A. That you ran the utility from an UNZIPPED folder. ...so repeat procedure if you were nervous and forgot those things. 15. Empty your trash. Get that thing out of the entire system. Reboot again. At this point the evil file should be gone. 16. Create a system restore point and continue with your life. 17. Once you know what you are doing, WindowexeAllkiller can be a convenient uninstall tool, especially if there are many software removals that you wish to make. However, most people will likely prefer to use WindowexeAllkiller "when all else fails." 18. As a pointer, there are some malware files that appear to be able to generate from previously installed windows versions that are stored in your new windows. These old version show up as "windows.old" and "windows.old.000" and are created when you install a new windows operating system where there is an existing windows operating system. There are many easily used instructions for deleting these on the web, but deleting these old versions does not guarantee removal of active malware from your current system. - Bug fix 05- Section. - Updated Database for Windows 10 Service and dll files. - Added Chinese Resource file. - update default service name for windows 10. - Added Czech(cs-CZ.ini Czech Republic) Resource file. - Added Dutch Resource file. 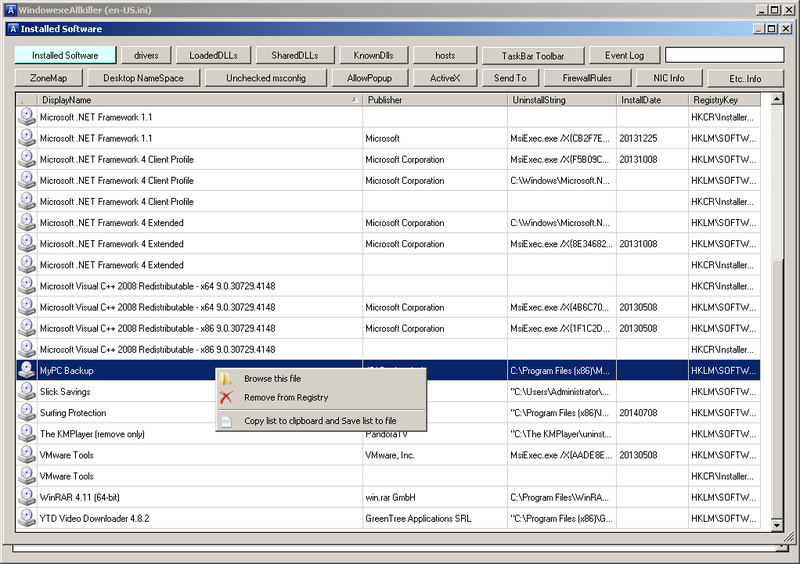 - Enables Quick checkbox mode. - Changed Section(22, 25, 26, 27, 28). ID:90849 [01-HKCUREG] - c59b4bb48e4ea93242e8610d7a8f5d20 - C:\Users\Administrator\AppData\Roaming\NvBackend.exe ..
WindowexeAllkiller is No Adware, No Spyware, No Viruses. I can't understand result of virustotal at all. Windowexeallkiller is harmless. Copyright (c) www.windowexeallkiller.com. All rights reserved.